Hello. My name is Michael Lopez. I'm currently a freelance copywriter based in NYC. Born and raised in Colorado, I graduated from the University of Colorado at Boulder in 2004. I then attended Miami Ad School Miami, Minneapolis, Amsterdam and San Francisco. I spent the following six years at Goodby, Silverstein & Partners, Venables, Bell & Partners and AKQA, before moving east, where I spent a glorious amount of time freelancing coupled with a two-year stint at Anomaly. I've freelanced at great shops like R/GA, Mother, Droga5, BBDO, Stink, VML, Firstborn, Saatchi NY, Trailer Park, agencytwofifteen, Deutsch LA, Publicis and Havas. Recognized by Cannes Lions, Webby's, FWA, Addy's, and CMYK. To launch Clos19, a new lifestyle retail platform from LVMH, our aim was to remind people about the value of authentic friendship. Working with the wonderful Mike Mills and Droga5 we created a delightfully intimate film, highlighting the memories and precious moments we experience with our loved one's, filled with laughter, tears, arguments or simply the joy of sharing a moment without saying a word. I had the privilege of working on the follow up to PuppyMonkeyBaby. We called it Body Party and it features millennial body parts dancing. "It came together really well." "It's a fantastic next episode for Kickstart." Guess what? The nation will never get to see it. Ask me for the password if you wanna see it. By the end of this 15-day side project, it had been discussed on Late Night with Jimmy Fallon, Goodyear became a hero, and over $25,000 was donated to South Central youth charity A Place Called Home. In short, four guys with no affiliation to Goodyear or Ice Cube whatsoever, crowd-sourced over $25,000 to convince Goodyear to fly a well-known lyric from Ice Cube's "It Was a Good Day" over Los Angeles. 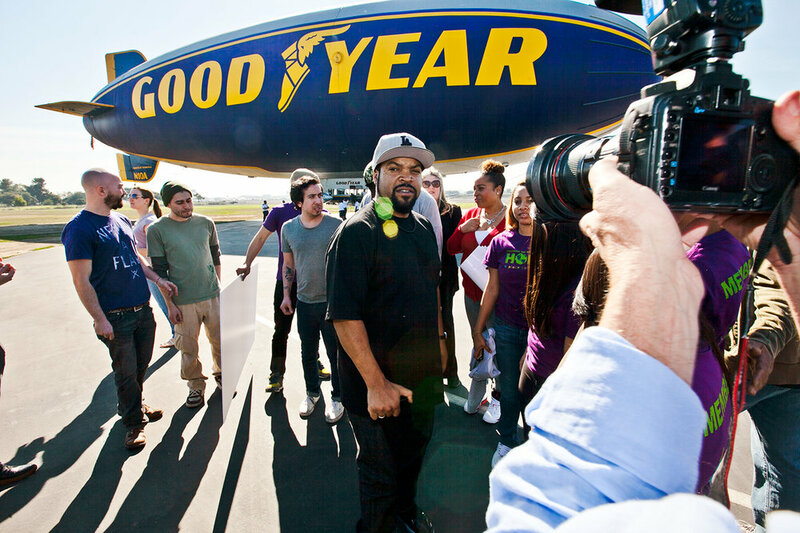 With the help of the Internet, Goodyear, and Ice Cube, we made it a 'good day' for some amazing kids. Also, I got to stand next to Cube as he marveled at his name on a blimp. With Brooklyn artist Michael Marsicano we made this limited-edition "hidden lyrics" poster. We gave these posters to people who donated more than $25. Those who donated top dollar were given "OG Editions" signed by Ice Cube himself. I have one myself hanging on my wall. Kids menus have lost their way. Somewhere along the line artificial ingredients became more common than the plastic toys inside them. So we took a stance by authoring a food promise to kids. Then we spoke with the only people qualified to talk about kids meals — kids. They talked. And talked. Eventually, we turned their thoughts into animated vignettes of change to show that some ingredients should be left to the imagination. Over a course of one day we spoke with real kids about ingredients found in kids meals. In return, we donated money to their college funds. Bacon's come clean. No more unsavory artificial ingredients. To celebrate, we gave the Internet a chance to come clean too. Over the course of two days, people using the hashtag #Baconfess could tweet us their deepest, darkest secrets. As a reward for their Baconfess-ions, we worked with Brooklyn-based tattoo artist, Knarly Gav, to turn our favorite tweets into real tattoos. Temporary ones. Because true bacon love should last forever. Temporarily. We launched the campaign with a social video starring Panera's Head Chef Dan Kish. Yes, Panera's real head chef. Trained in the culinary arts, untrained in the theatre, I think we managed to make Dan look and sound great. These spots turned out well considering everything that could have gone wrong. We released each one over a period of two days to keep the momentum rolling. As tweets rolled in, we had an awesome team to make sure production moved right along. Together with Knarly Gav, we chose tweets we thought would make interesting tattoos. With one rule: bacon must be featured prominently. Those lucky enough to have their Baconfession chosen were immediately mailed two temporary tattoos along with a special note from us. Food should be many things. Delicious, comforting, conversational and good enough to shove right in your mouth. But food should also be food. People are literally sick of eating food burdened with artificial ingredients. So Panera sought to change what we're eating by removing everything from their food that wasn't food. That's some life changing news right there. So we were challenged to rebrand the company and create a new campaign. What came next was a rapid outpouring of broadcast, activations, print, radio, banners and social. Phew. Don't worry. I'll give you the short version. We began by capturing small moments between family and friends, so our advertising felt more realistic and aspirational. Before Panera came to us, their social presence was nothing more than boring food pics and uninteresting copy. So we made sure every post was something more than a swippable moment on a mobile phone. We crafted stories while challenging ourselves to talk with people — not at them. We wanted people to immerse themselves with Panera's offerings in a relatable, interesting and beautiful way. Influencers. Yaaaay. Tasked by the client to do something - anything - with their favorite influencers, we shot and edited a ton of content in a matter of two weeks. You can't do a proper rebrand without changing everything from top to bottom. Walk into any cafe and you'll find my words. Since Food as it Should Be was introduced sales have climbed for Panera higher than ever before. These things tend to happen when a focused approach is executed by a talented team. We were tasked with launching a campaign for Comcast Sportsnet's new primetime sports news show. Only we had to do it for a small print run in the San Francisco Chronicle. To catch the eyes of sports fanatics who live and breathe sports enough to read stats, we decided to place humorous hyper-detailed teaser ads in the scoreboard stats section. In order to keep up with their fast-growing marketplace, Etsy decided to update their platform by increasing transaction fees and introducing monthly packages. That's a tough pill to swallow for any small business. So how do they break the news? Etsy has something that everyone in their creative community could relate to: they're a business that started out small too. In a tiny Brooklyn apartment no less. So if we could make the seller community understand Etsy's journey through the years, maybe they'd see things a little bit differently. Goodies inside. We used HTML5 to create an experiential pop-up world so visitors could tour an array of Visa Signature perks. It allowed users to buy movie tickets, take a 360-virtual tour of a luxury hotel room and even take a drive through city and country exploring a multitude of perks. And most importantly, beyond the technological innovation, we gave our client an execution that behaves like a million dollar iAd for the price of a simple iPad ad. It was shortlisted in 2011 Cannes Cyber Lion, featured in OMMA Mobile Conference in 2010, FWA Mobile and selected to be part of the 2011 Mobile Case Study Book by Taschen. I had a delightful opportunity to inject some fun into what normally would be a very serious investing print ad. Here's a few of the humorous headlines that ran in a number of serious magazines. Despite launching the Food as it Should Be rebrand for Panera, consumers were still having a hard time grasping the concept of 'clean' food. With little money, we were challenged to create a spot to shed some light on Panera's core values.